Time for another post in what's probably my favorite section to write about in my entire blog (because it involves eating delicious food!). After having it on my "places to dine list" for quite some time, the boyfriend and I finally got around to dining at Sushi Yasuda, a traditional Japanese sushi restaurant. We didn't do omakase like we did at Tanoshi's, but instead ordered a la carte. We've heard from our friends and read reviews online that Sushi Yasuda is very traditional when it comes to sushi. Therefore, no spicy tuna, no California rolls (I don't even think that's really Japanese sushi), and definitely no tempura flakes in your maki rolls. 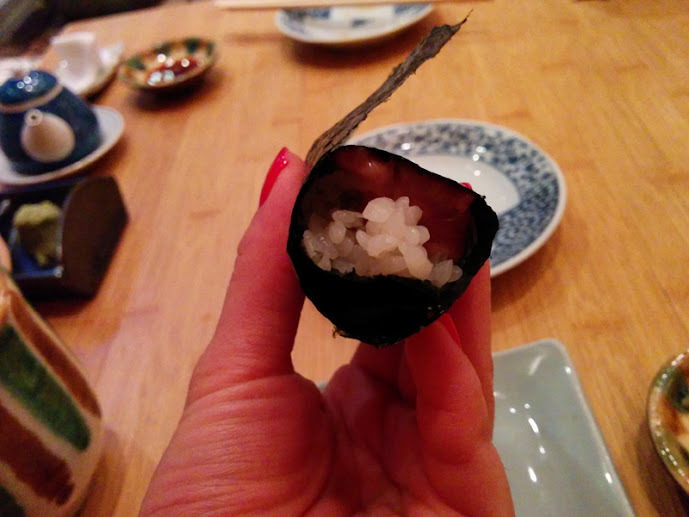 To view the pictures of our delicious dinner and my review of the sushi, click through the jump! As a disclaimer, I apologize in advance for being too ravenous at the time I was dining at Sushi Yasuda and subsequently forgot to take pictures of the hamachi, fluke, and squid! As the subtitle above says, this was a small complimentary starter. My boyfriend and I don't actually like green beans, but this starter was delicious! 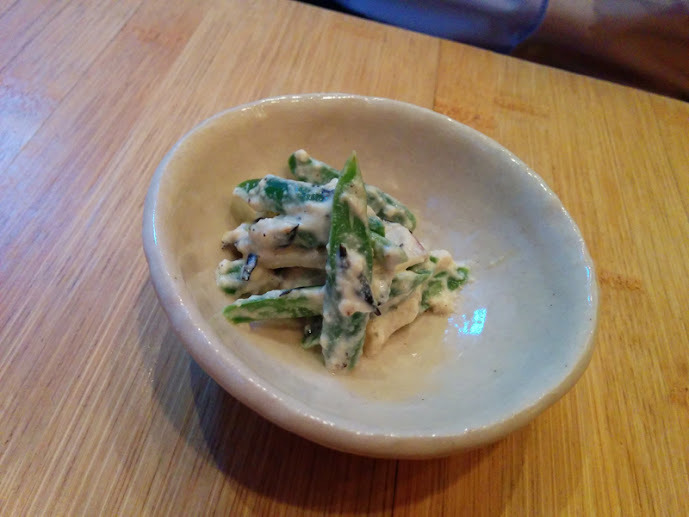 The green beans were tender, and tossed in a sweet and savory mayonnaise. Each of our starters also had a tiny sliver of apple in it. It was a refreshing starter that made us excited for the meal to come. 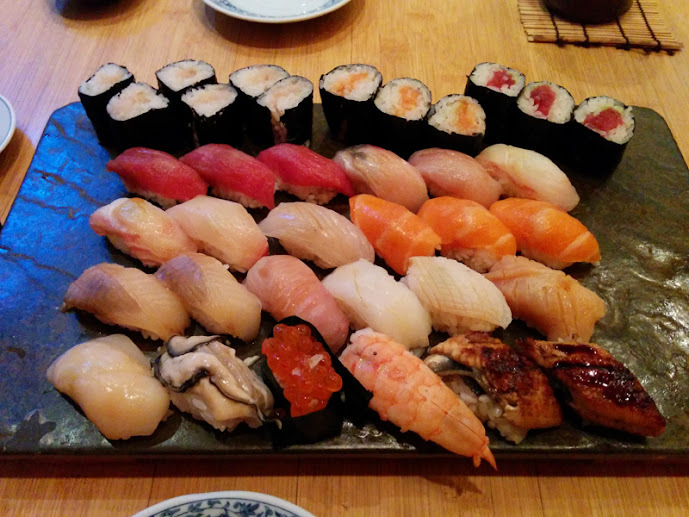 Our sushi matsu consisted of: tuna, hamachi, fluke, striped bass, orato, salmon, rainbow trout, spanish mackerel, squid fin, squid, orange clam, scallop, oyster, salmon roe, shrimp, and unagi. The half maki rolls were king salmon & tuna. The al la carte cut roll was white salmon. Some of the pieces were part of my boyfriend's meal, and therefore I did not eat the scallop, squid fin, oyster, striped bass, or shrimp. It seems proper that I should start out with the standard tuna. The tuna at Sushi Yasuda had a very strong tuna aroma. I will be honest that I was slightly disappointed by the tuna here because it tasted not too different than the tuna at other establishments. It wasn't anything like the tuna I had at Tanoshi which had an amazing meaty and substantial texture. It was good tuna, but I guess for an establishment that prides itself on having high quality fish, I was expecting a little more from the tuna. 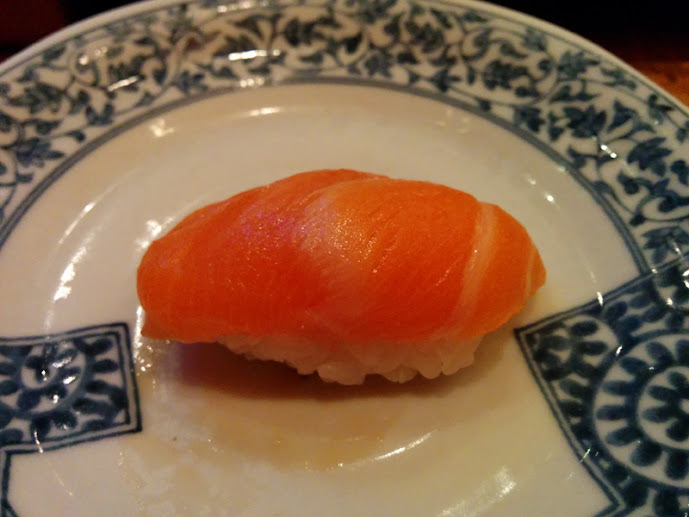 Salmon is my favorite fish to eat when it comes to sushi because it's naturally rich in flavor. 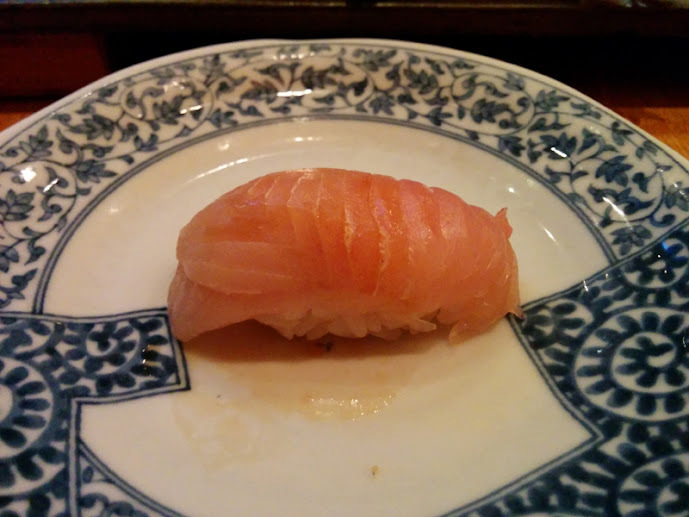 The classic salmon at Sushi Yasuda was good, but like the tuna it wasn't anything memorable. It wasn't bad, but it wasn't on another level either. I would not order it again only because there is a piece (reviewed further down the list) I absolutely loved and it is very similar to the salmon. 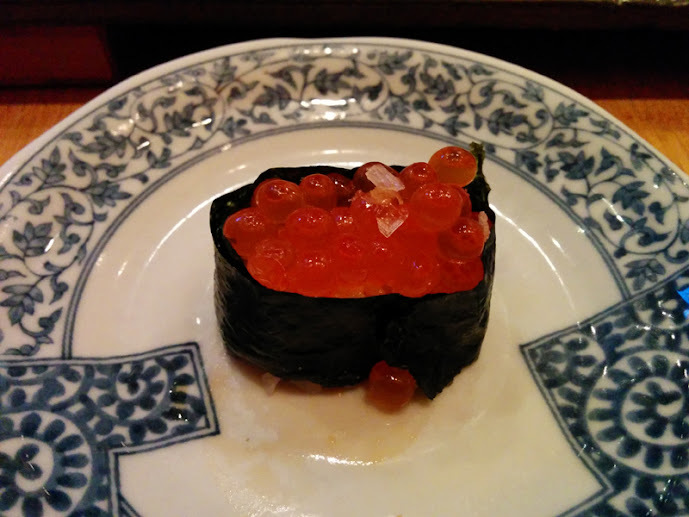 If you read my review of Tanoshi's salmon roe, you'll know that I actually liked it (and I usually don't like salmon roe). The salmon roe at Sushi Yasuda can't be fairly compared to the roe at Tanoshi's because the amazing part of eating omakase is that the sushi was literally made right before it hits your plate and it is given personal attention by the sushi chef. Therefore, the rice is still somewhat warm, and the seaweed is freshly toasted & very crisp. Those are the reasons why the salmon roe at Tanoshi was delicious. Unfortunately, those qualities weren't in the salmon roe at Sushi Yasuda because we didn't do omakase. Still, the roe was good, it was definitely saltier than the roe I had at both Tanoshi & Sushi of Gari. 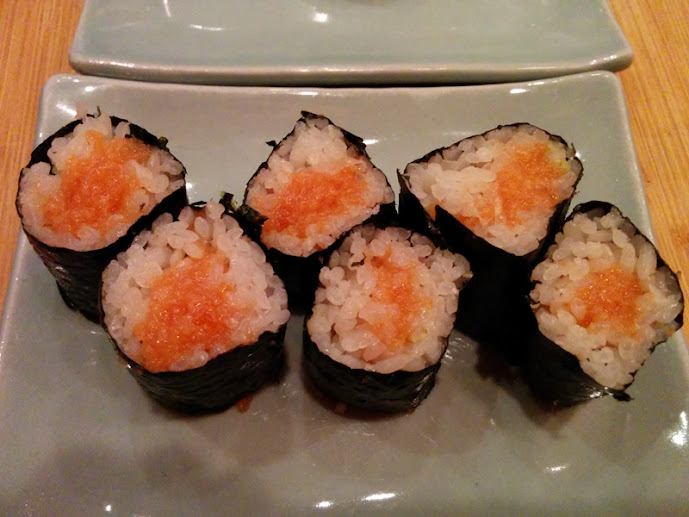 If you enjoy eating roe, you would enjoy eating the roe at Sushi Yasuda. I'm going to just tell you immediately about what I thought about the unagi at Sushi Yasuda - it was amazing and the best unagi I have ever eaten in my life. First off, I don't even like unagi! It's always drowned in sauce and there is a particular smell to it that I don't like. It also is usually too dry and flakey for my tastes (which is probably why its doused in sauce most of the time). The unagi here was amazing. It was moist, tender, not drowned in sauce, and crispy in some parts. If you love unagi, you must get it at Sushi Yasuda! However the flipside goes as well, if you don't like unagi like me, give it a chance at Sushi Yasuda - you'll be very pleasantly surprised! 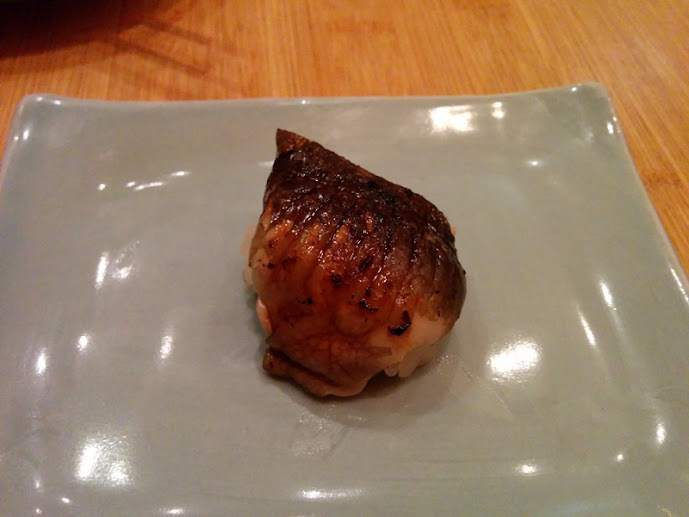 Oh anago, I was expecting much more from you because the anago at Tanoshi's was glorious. However, this was the most disappointing piece from the entire dinner. The texture was very off - in fact it was sort of slimey and jello-like in some parts. 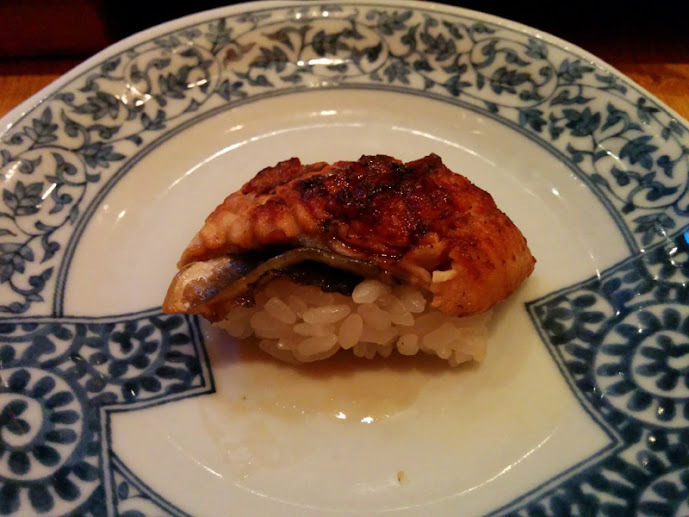 It tasted nothing like the anago at Tanoshi, or the unagi that we had as part of the sushi matsu. I'm not sure if it was just my piece that had this texture, but nevertheless regardless of texture the flavor was not as rich as the unagi. It is definitely a pass the next time I come back. I've never had raw mackerel, but if you've ever had cooked mackerel, raw mackerel tastes very similar. It was exactly what I expected it to taste like since I've had cooked mackerel many times. It was definitely not as "stinky" or fishy as some cooked mackerel can be, but it was still rich and oilier than the other fish in the dinner. Overall it was good, and I wouldn't mind ordering it again if I was at Sushi Yasuda. I remember the rainbow trout was like a hybrid between the rich fishy aroma of hamachi and the texture of tuna. If you like both of the flavors of those fish, then I think you would enjoy the rainbow trout. The boyfriend and I have never had rainbow trout sushi, but we both agreed that it was good and definitely something we would consider ordering again. Most people go crazy over toro (fatty tuna), so I thought it would be proper to try the toro at Sushi Yasuda as well. Since we got quite a few maki rolls, I decided to opt for the hand roll. 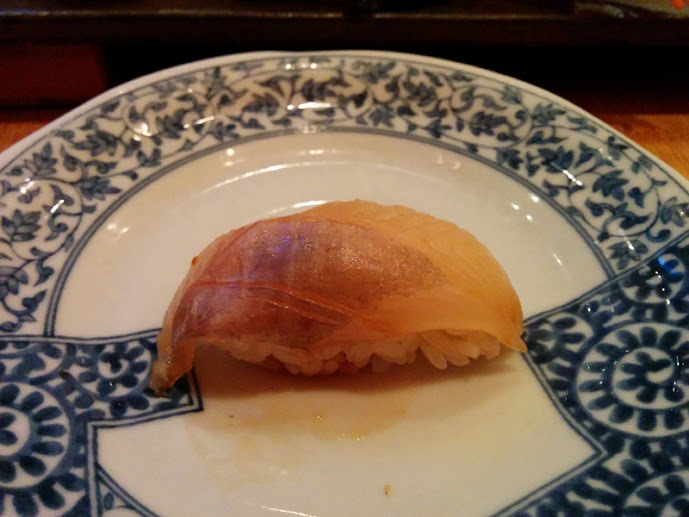 I knew not to expect the nori to be extra crispy because we weren't doing omakase, thus the seaweed was slightly soggy but it was still crispy enough. The toro was so tender that I thought they put some mayo or oil in it, but of course Sushi Yasuda doesn't do spicy tuna rolls, so I knew the fish itself was super tender. It definitely was more oilier and richer in flavor than the standard tuna. 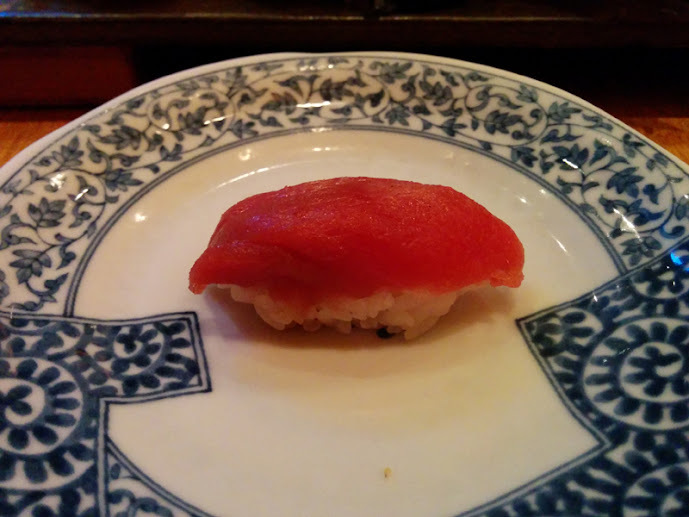 I enjoyed the toro more than the standard tuna. If you like toro, you will enjoy the toro at Sushi Yasuda. Yep, it's actually white salmon! My boyfriend and I decided to get the maki roll because white salmon is an uncommon fish. Up close, it looked like hamachi or even albacore. However, when I tasted it, it was definitely reminiscent of salmon. Since most of us know what classic salmon tastes like, I will compare white salmon to it. White salmon tastes much cleaner than classic salmon. It's similar to what cauliflower tastes to broccoli. I would say that since there aren't many establishments that offer white salmon, definitely give it a try. It was one of the highlights of the meal. If you made it this far down the list, you're rewarded because I saved the best for last! I got the king salmon maki as my half roll as part of the sushi matsu dinner, but it was so good that I got another maki roll a la carte. The king salmon maki is the best tasting salmon I've ever had. It's completely different from normal salmon, and I implore you to eat a normal salmon sushi first, and then try the king salmon. The difference is huge. King salmon naturally has a salty taste to it, and it's just full of amazing flavor. I can't describe it well because words don't do it justice - you must try the king salmon sushi, sashimi, or maki roll if you dine at Sushi Yasuda! It was clearly the highlight of my (and my boyfriend's) entire meal, something that I will dream about eating again, and definitely a reason to go back to Sushi Yasuda for. Sushi Yasuda offers both a la carte as well as omakase dining. You can dine omakase at the individual tables, but the experience will definitely not be the same. 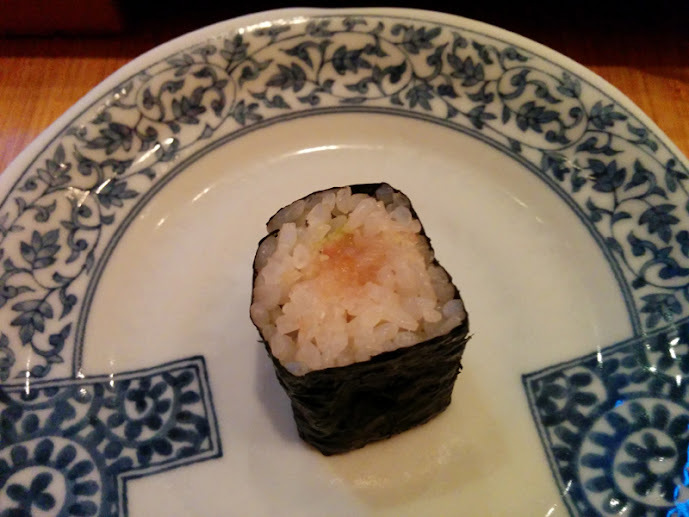 If you are doing omakase, definitely try to get a reservation at the sushi bar. Actually, if you are planning to do omakase, you should only be planning to sit at the sushi bar in order to get your money's worth! The boyfriend and I are definitely going back since we had some pieces we definitely enjoyed, and I would highly recommend Sushi Yasuda to any avid traditional Japanese sushi lover.